Departs from Gisborne Station and runs via Early Street, Chessy Park Drive, Station Road, Aitken Street, Robertson Street, Robertson Street, Goode Street, Howey Street, Penny Green Drive, Daly Steet, Melton Road, Willowbank Road, Bloomfield Road, Fersfield Road, Keily Road, Howey Street, Rodney Street, Fisher Street, Calthorpe Street, Melbourne Road, Hamilton Street, Aitken Street, Station Road, Chessy Park Drive and Early Street to Gisborne Station. GisBus is an on-demand bus service operating in the township of Gisborne. 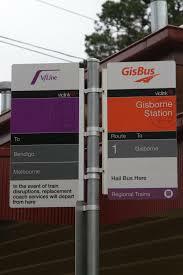 The service provides access between the Gisborne town centre and Gisborne Train Station. 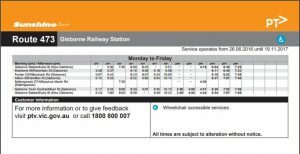 The bus will run in the morning and afternoon peak periods Monday to Friday, and will connect to train services to and from Melbourne. The bus will travel to stops along a route between the Gisborne town centre and station. You can make bookings in advance for pick ups from a designated roaming area in Gisborne. The service will ‘roam’ before the AM Gisborne Town services and after the PM Gisborne Town services. The bus will ‘roam’ as required, allowing passengers who have pre-booked to board the bus from an address within the designated roaming area. To book go to GisBus.com or call 1300 GISBUS (447 287) by 8pm on the day prior to travel. When returning home, simply tell the driver which stop you wish to travel to or where in the roaming area you would like to be dropped off. For residents who have a regular time and day of travel, a recurring booking can be made, eliminating the need to make a separate booking for each trip. Fares are $1.10 concession and $2.20 adult. Passengers with a valid V/Line ticket travel free.